A ruptured wide-necked aneurysm arising from the bifurcation of the basilar artery (BA) was found in a 40-year-old male patient who presented with an acute subarachnoid hemorrhage (SAH). The origin of both posterior cerebral arteries (PCAs) arose from the base of the aneurysmal sac. Given the risk of rupture, and the unfavorable anatomical configuration of the aneurysm and its location, an endovascular approach was considered to be the best treatment option. The aneurysm was treated by coil occlusion involving temporary deployment of two Comaneci devices in order to support the coil cast and preserve the parent artery and both PCAs. The patient recovered fully with no new neurological deficit. Follow-up DSA examination at 3 and 12 months showed no evidence of the aneurysm having reoccurred, which is a risk if the coils compact enough after the procedure. Indeed, the DSA showed that the aneurysm had been completely obliterated, while both PCAs were still patent. 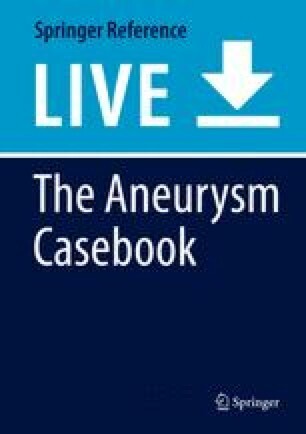 The main topic of this chapter is the unique and safe application of two crossed Comaneci devices in a ruptured aneurysm with unfavorable anatomy. This eventually resulted in the aneurysm being completely obliterated, while the parent arteries arising from the aneurysmal neck remained patent.